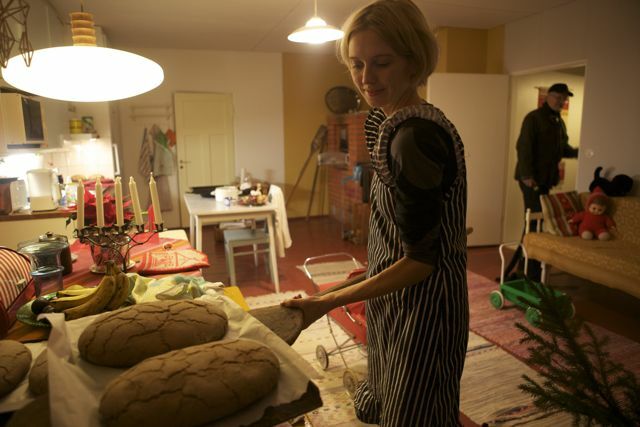 As I reflect on my experiences to date of this Finnish Adventure, I must acknowledge that this breadbaking process has to be the highlight. Many people live a lifetime in a country, or study its history—yet never experience what it was like for early citizens. 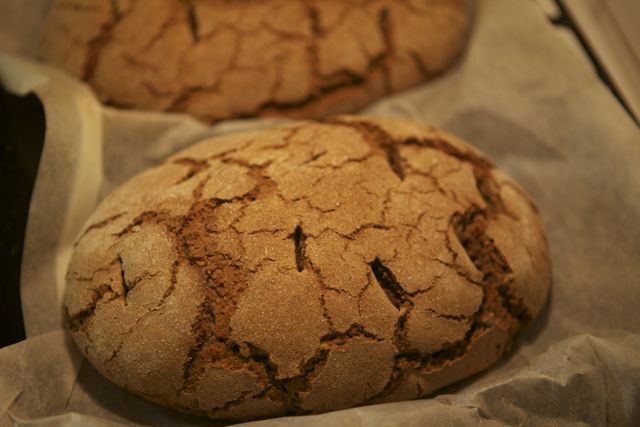 Of course, breadbaking and dark rye bread is not the sole experience of the Finnish culture, but actually, it was and still is in many respects, the sustainence of the culture, the people! I feel so grateful to have taken part in this vital practice and am so grateful to Ulla Engestrom and her family for providing it! *A sourdough starter needs replenishing frequently to prevent it from dying. 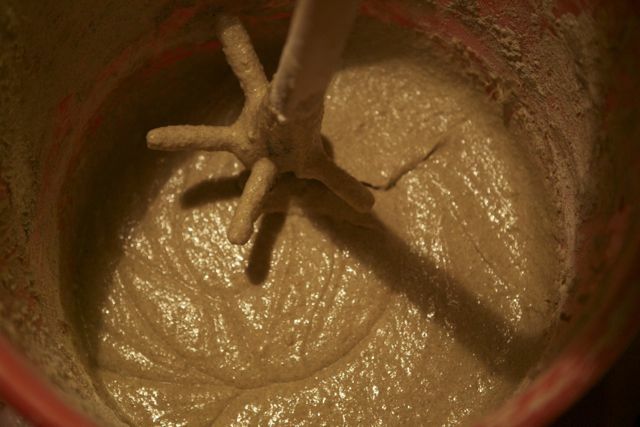 A fresh starter in the refrigerator needs new flour added about every 12 days. The longer a starter is alive, the more sour and flavorful it becomes. So imagine what kind of magic is brewing is in this sourdough starter after a few hundred years or longer!) These Finnish ancestors didn’t watch CNN or wait for a study to come out; they just knew what was good and they knew that the secret is in the starter! Due to the cold climate, the Finns have found an easier way to maintain starter (or what they call the “root”) by freezing it. This makes it less time intensive to maintain. Next, I must qualify the inconsistency of what is to follow. Not only was this process stressful from the point of the pressure we were under to make 8 loaves of bread with a recipe we had never used before in an oven we had never used before, while being surrounded by little ones, a feverish baby, as well as my lack of knowledge of the language, I found out later a few things that make it veritably miraculous that we pulled this off! You see, I have been baking bread for over 35 years now. In fact, I used to bake and sell my homemade bread 25+ years ago in Loveland, Colorado. I had my own sourdough starter and rye bread recipe and prided myself on the taste of my bread. So, you can imagine the pressure I felt when my Ulla informed me well towards the end of the process that she was receiving the details of the recipe over the phone from two different grandmothers, sisters who were each over 85 years old, and who each disliked the other’s bread recipe! The comedy of this moment was all I could embrace because I found out about this at the point when it was too late to do anything; the bread was already in its final rising. I laughed and performed my third prayer that everything would work out. 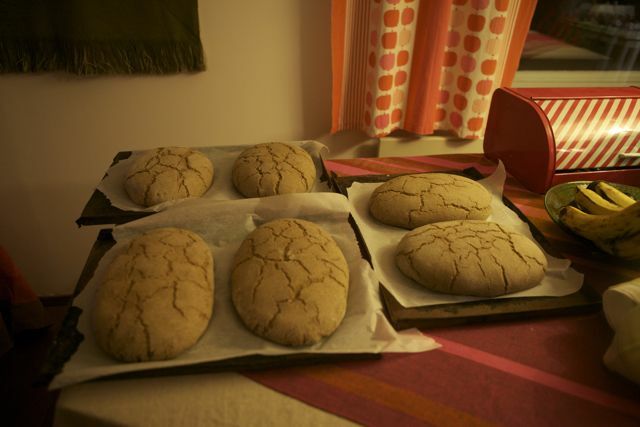 I had my doubts all along because it wasn’t looking like I knew it should, because I DID know how it should look, although I admit I even felt like a newbie bread baker in the wisdom and presence of over 5 generations from the homeland! How did we do it? I will post what we did and then I will post what I think we should have done in italics right after each step. I think these adjustments will yield a better, more edible product, even though we were actually able to eat the finished product. 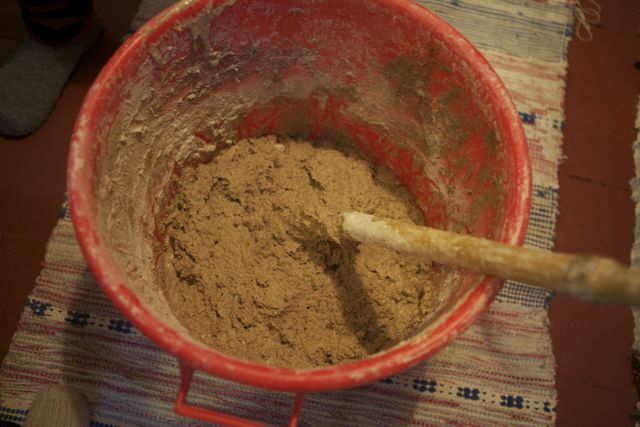 PUT 4.5 LITERS OF LUKEWARM WATER & 1 square of yeast (this is the equivalent of about 2 packets of dry yeast) & MIX WITH ENOUGH FLOUR TO MAKE IT THE CONSISTENCY OF THICK SOUP (Okay, this is where we made the biggest mistake right off the bat! I didn’t have the full information at the time of Day 2. From my experience, I never put all of the yeast in the starter mix at this time. I usually put 1/3 of it or so and let that sour for the day before actual baking and then I add the rest of the yeast in the next day just before adding the remainder of the flour. But, I think the ancestors know best, so I would also add all of the yeast in this step. However, considering how absolutely dense the final product was, I would double the yeast. This is for 8 loaves, so I would add 2 squares of yeast or 4-5 packets of dry yeast. We actually did NOT add any yeast at this time and found out much later that we needed to add all of it. resemble something a caveman used, and probably could have been! 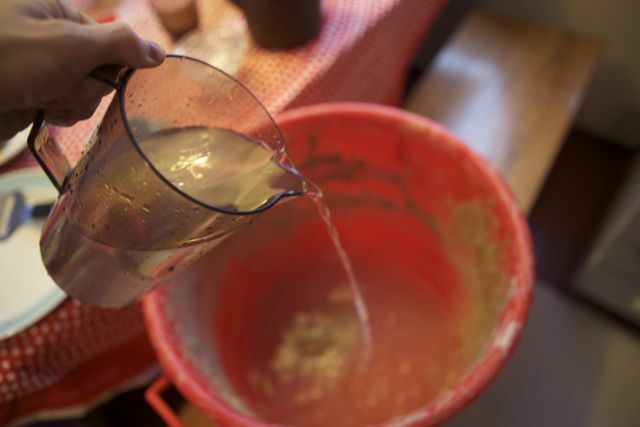 Today, it is actually being used as a powerful whisk, which is necessary when you are mixing what we were mixing in a 5 gallon bucket. I don’t know what type of wood it is, but it is very strong. Sourdough Starter with Yeast, Warm Water & Enough Flour to Be Soupy like Porridge-Notice the Fine Mixing Tool! where cultural differences can really create confusion. What I thought was “porridge” was not what the Finnish know as “porridge.” In a comical revelation, I went to stir the mix later that morning and found it to be much thicker. 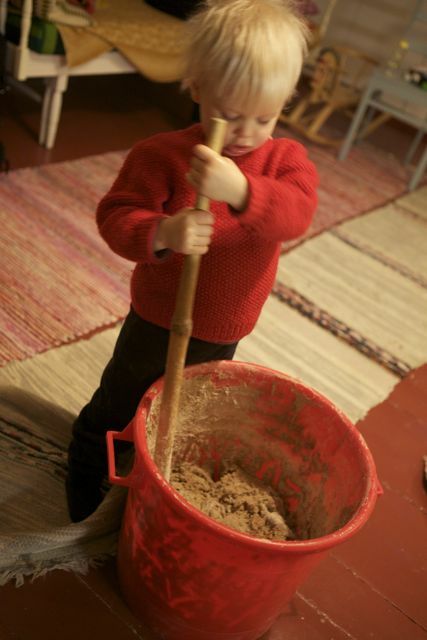 Ulla and her father had added more rye flour because it hadn’t been like porridge–as they know it. You see porridge is oatmeal and the way my friends prepare porridge (purro) in Finland is much thicker than my own reference. When I heard “porridge” I thought of my own idea of a more viscous substance. Ulla’s father, Pekka was the only real witness to this process that we had available. We were in the house he was born and raised in. Who knows how many times he saw that bread being baked throughout his life. We hailed to his wisdom! Do not question authority! Due to the science this bread baking and the fact that there is no additional sweetener for the yeast to feed off of, I assume this is the reason the mixture needs more flour added than I have added to my own mixture in the past. I usually add a little molasses to help darken and feed the yeast, but this would still interfere with the sour quality, so I guess I have learned something here. The yeast needs more flour in this bubbly, first sitting, which it will feed off of instead of any added sweetener. TWO HOURS AFTER SITTING. THEN, TURN OUT ONTO FLOURED BOARD. This was not as easy as one would think. I really upped my game with this ball of dough! This is how women used to keep their guns packed! Someone had the brilliant idea to split the work in 2. Partners in crime while Ella supervises. 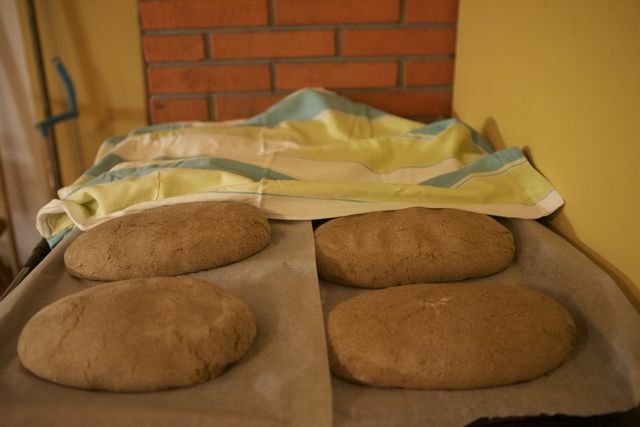 FORM LOAVES AND SET ONTO PARCHMENT, COVER AND SET TO RISE IN WARM PLACE-NO DRAFTS (Divide dough into 8 equal parts and make each loaf a similar shape for even cooking.) I was so nervous about this step and just praying that the loaves rose properly. I didn’t feel as if there was nearly enough yeast to do the trick. Scoop coals into bottom compartment of oven to retain heat and make room for loaf pans. P.S. I am not THAT heavy, just layered with winter clothing!! The loaves actually rose with that familiar crackly look! PUT LOAVES IN OVEN AND COOK BEFORE OVEN COOLS, ROTATING AS NEEDED. 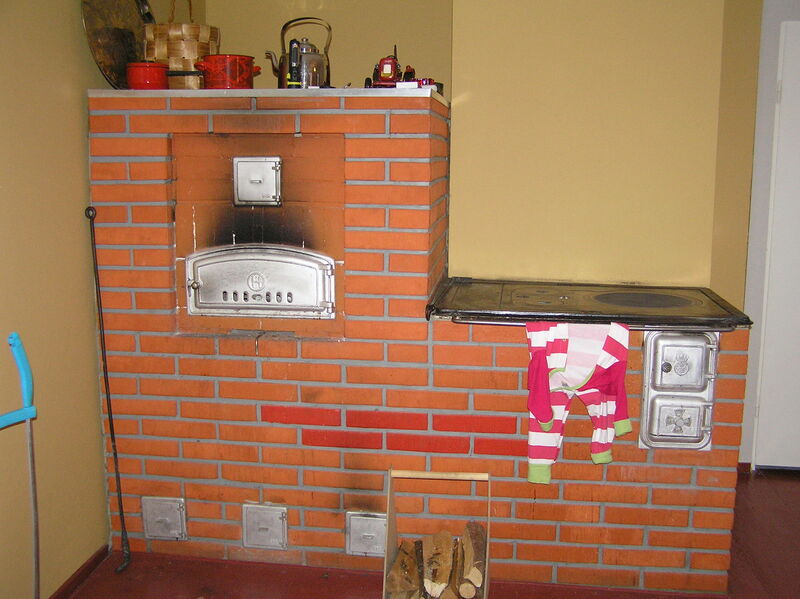 Thank goodness for the modern oven! We actually used the small electric oven in the house for the 2 loaves that couldn’t fit–just in case we really messed up the others. 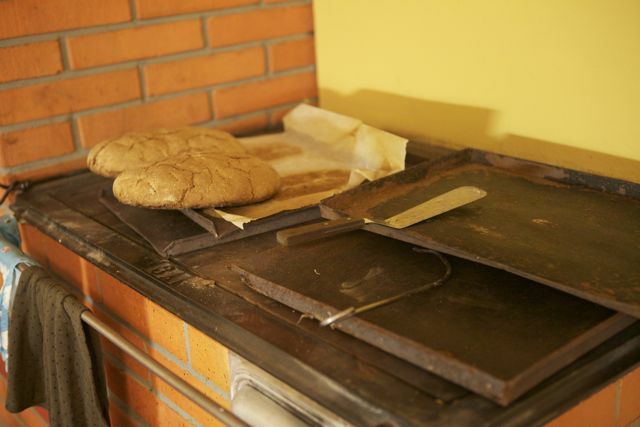 It turned out we had to use this electric oven for all of the loaves eventually, as we rotated them between the two ovens to get the brown effect of the bricks too. 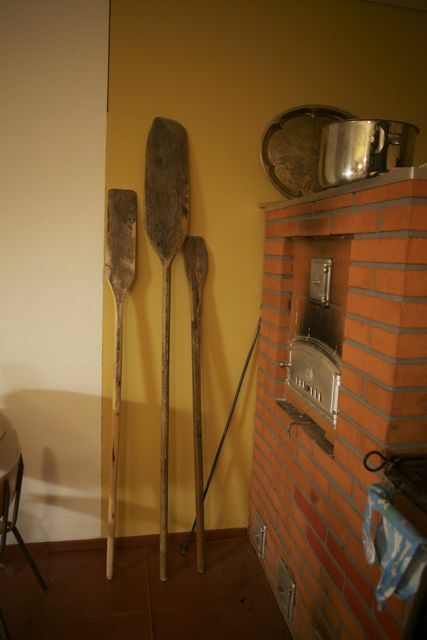 That was the stressful part for me, to make sure all of the loaves were cooking evenly and thouroughly without burning completely. While Ulla cared for little Ella, who was sick with a fever, I diligently focused on this rotation process. AFTER THE BREAD HAS A HOLLOW SOUND WHEN TAPPED, IT IS READY TO REMOVE FROM THE OVEN. TAKE CARE TO CHECK BOTH BOTTOMS AND TOPS THROUGHOUT BAKING TO ENSURE EVEN COOKING OF ALL LOAVES. The brick oven as we found out has many hot spots that produce a dark bottom crust, which is good, as long as it is not to burnt. AFTER THE BREAD COMES OUT AND THE TANTALIZING SMELL OF BAKING BREAD HAS INCREASED EVERYONE’S APPETITE, ABOUT 5 MINUTES OF COOLING ON A RACK IS NECESSARY TO PREVENT THE BREAD FROM BINDING UP INSIDE WHILE CUTTING, even though no one will want to wait. TIME TO SLICE & ENJOY!!!! After about 5 minutes of cooling, slice & enjoy! Eliel is the first taste tester! 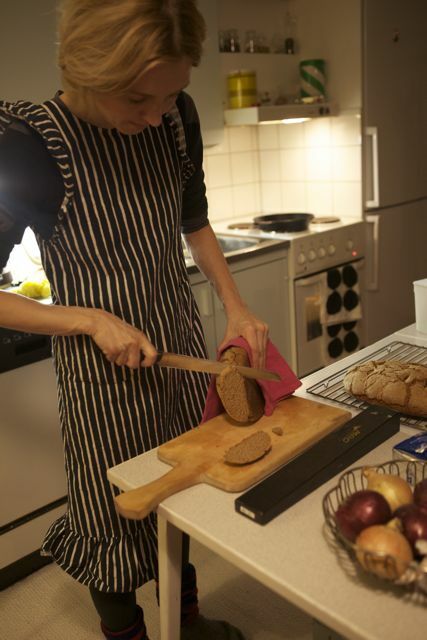 HAPPILY, THIS BREAD CAN NOW BECOME THE MAIN PART OF THE CHRISTMAS EVE FEAST- which it did! 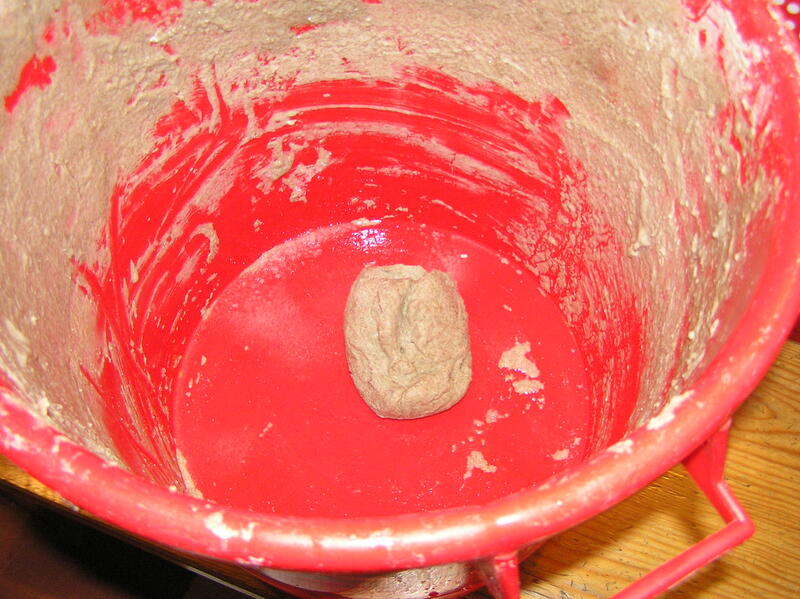 We found that due its sourness, it is best savored by cutting the sourdough rye bread very thin. Wonderful with freshly churned butter or salmon roe & cream!!!!! Yummmm….. This experience would not have been possible without the wonderful support, partnership and encouragement of Ulla, Jyri, and Ulla’s dear family, and her father Pekka, who helped us retrieve the starter, the salt, the famous bucket and whisk, and who kept the coals going in the oven. Also, I personally want to thank the grandmothers (Mummis) who gave us the use of their starter and their recipe/recipes! 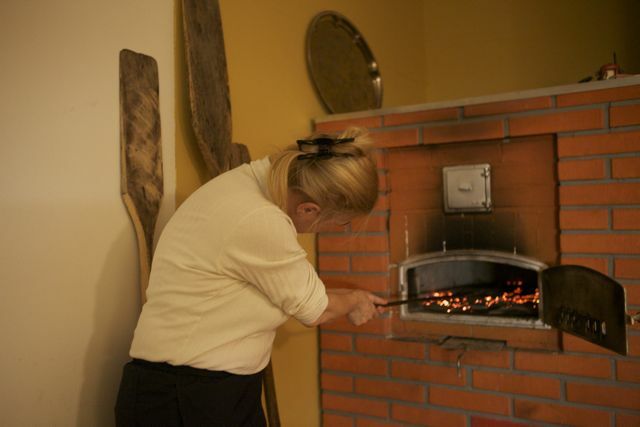 It was funny that in the middle of the rising, we actually had to heat the oven some more and one of the Mummis showed up to help us out with advice. She was so sweet and I only wished I could have understood her, but I was there listening and watching, and questioning everything she said afterwards like a curious child. Her warm and supportive eyes and smile are a priceless memory I will always cherish. After the baking was all said and done, we shared a loaf with each of these Mummis. And of course, the one who likes a denser loaf said the bread turned out perfect, while the one with a different recipe said the loaf was too dense! This was worth a chuckle, now that the stress of making sure it turned out at all was over. What an incredible experience immersed into the culture of people who are not my blood relatives, but from the country of my blood relatives. I highly recommend it for anyone who really wants to understand the Finnish winter culture! PLEASE COMMENT ON THIS POST!!!!!!! I can’t stand it another minute! I cannot bear to wait to share the perfection of these moments with anyone and everyone. 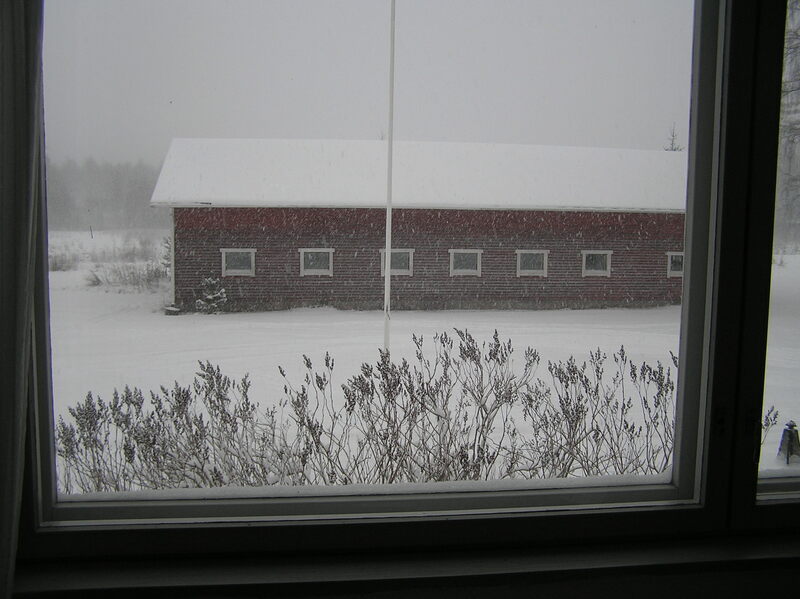 I am in the midst of the picture perfect Finnish Christmas that one could only dream of experiencing. With my own Finnish family roots, I feel as if I am capturing a slice of culture to pass on as I take in every precious moment. After a 5 hour train ride to the North East of Finland, we are staying in the family home where my dear friend’s Grandfather was born. It was once a very large estate, but now it is smaller, only about 42 hectares (1 hectare is about 2.471 acres). 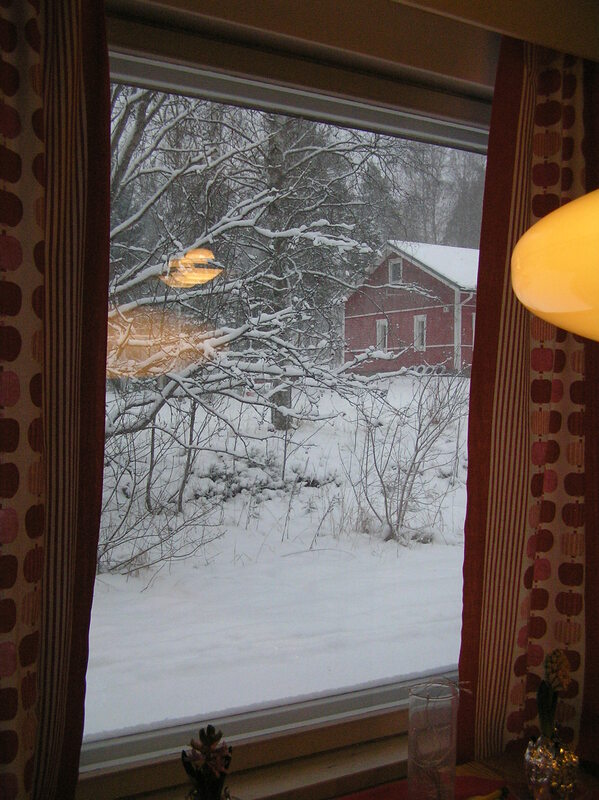 I am surrounded by snowy, tree filled landscape, ancient outbuildings and the most endearing brick oven which we are going to bake our traditional Finnish Rye Bread today. With all of this and more, I am so overwhelmed by this perfect and blessed moment in my life that I cannot possibly recall everything. I am too busy enjoying it, which is what I should be doing. Just had to post a note and will continue to do so as the opportunity arises. Between sick babies, cooking, rearranging the house, preparing for Christmas, and baking this bread, I am in a place called Finnish Christmas Heaven! All I need is Santa Claus and my own loved ones to make this dream complete. This is the only way to travel! How could you ever understand a culture otherwise than by living in the moments amidst the families that are a part of it? The snow has started to fall quick thickly again and I have to get to work! Merry Christmas!!!! !